Sundargarh/Sonepur: Prime Minister Narendra Modi on Saturday exuded confidence that maximum number of lotuses will bloom in Odisha. “This time lotus will bloom in Odisha. 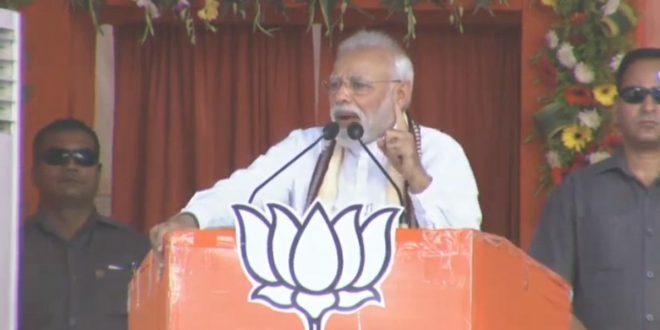 I can say with certainty that a maximum number of lotuses will bloom in the state,” said Modi while addressing an election rally in Sundargarh. Odisha will face Lok Sabha and Assembly elections simultaneously in four phases beginning on April 11. He said people must decide whether they want an honest and principled government or a corrupt one. He said the BJD government lacked intention for the state’s development while indulging in regional discrimination. He also accused the BJD government of ignoring development in the western part of the state, much like the Congress government at the Centre had ignored development in the eastern part of the country. “You have seen the works of Congress in the Centre during its decades-long leadership. You have also seen BJD ruling Odisha for the last 19 years. And now you have BJP’s works in front of you. This ‘Chowkidar’ has pledged and taken the responsibility to build the entire eastern India as the ‘development engine’ of the new India,” said Modi. The Prime Minister alleged that the BJD has obstructed the implementation of financial assistance to farmers and free treatment to the poor under Ayushman Bharat Yojana. Later addressing a rally at Sonepur, the Prime Minister attacked the Congress and BJD for playing vote bank politics on poverty. He said while farmers are in distress, people are migrating to other states in search of jobs. “Odisha is rich with abundant natural resources. But, what is the cause that the state lags behind in terms of development,” asked Modi.